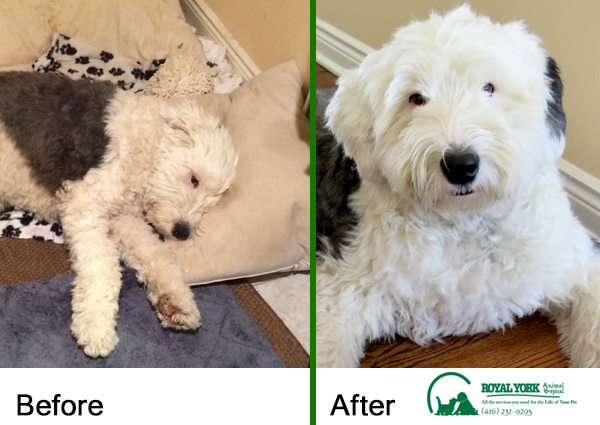 At the beginning of January, Darwin, a 4 year old Old English Sheepdog was brought in for an exam for limping and lethargy. His limping was progressing very fast and within 24 hours he could barely walk! Our pet X-rays revealed no fractures or signs of bone cancer or any other abnormality. However, his dog blood work, surprisingly, showed that the dog had Lyme disease. Since he had been tested for Lyme disease (along with his Heartworm test) in March of 2013 we were able to figure out that sometime between then and December 2013, Darwin had contracted the disease. The ONLY way for him to have contracted Lyme disease was from a tick. But his owners had not found any ticks on him but he is a pretty hairy guy as most dogs are so it is not that unusual to miss. The scary part is that Darwin had not traveled anywhere and had stayed in Urban Etobicoke the entire time. Darwin was so sick. He could barely even lift his head when he was diagnosed. Amazingly he responded extremely well to treatment for Lyme disease and after about 3 days of medication he was almost back to his normal self. 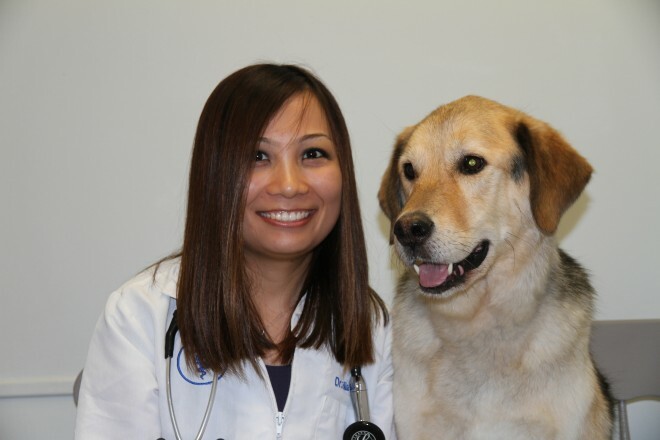 As many of you know, at Royal York Animal Hospital in 2013 we started to include tests for Tick-borne diseases when your dog came in for his yearly Heartworm test. Along with Darwin there were also 24 additional dogs who test positive for Tick-borne diseases at our hospital. Here’s a picture of some ticks. Ticks tend to attach onto a dog (or a person) and not move around like fleas do. The smallest ticks are about the size of the period at the end of this sentence. After sucking blood from a dog they tend to get bigger and look more like the ones in the right of the picture below. Ticks tend to be out in the spring, summer and the fall. As long as the overnight temperature goes above 3C ticks start to emerge. They do not need longer than that so they can fool us when the temperature is about 3C for only a day and then plunges again. They tend to hide in tall grass or brushes, and when a dog walks by they grab onto them and attach. It’s important to check your dog daily, especially after they have been to wooded areas. Because it takes some time for a tick to give a dog the bacteria responsible for Lyme disease and other tick-borne disease, the earlier the tick is removed the less likely the dog will contract the disease. Our 4Dx test for heartworm now include screening for Lyme disease, Ehrlichia and Anaplasma which are the most common diseases transmitted by ticks. So your dog will automatically get screened for these every year when they get their heartworm test done. If your dog has had ticks in the past, or if they will be going to cottages / wooded areas / Eastern Ontario eg. Kingston/Thousand Islands area, then FOR SURE they should go on tick prevention along with their regular flea and heartworm preventions.